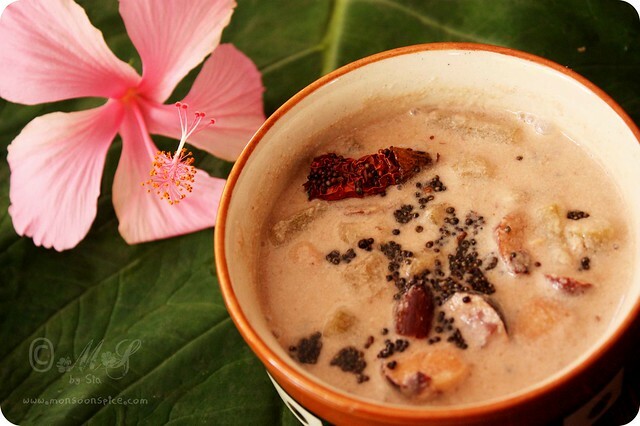 Monsoon Spice | Unveil the Magic of Spices...: Tender Colacasia Stems and Jack Fruit Seeds in Coconut Gravy: Try something new today! 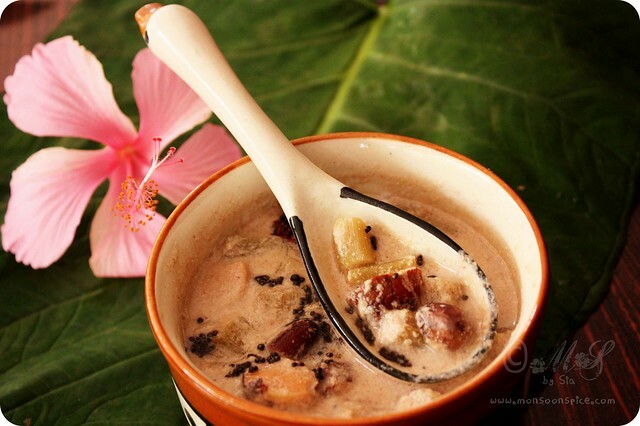 Tender Colacasia Stems and Jack Fruit Seeds in Coconut Gravy: Try something new today! They were newly wed couple. It was just over a month since they got married and entered a new chapter of their life. HE was arrogant, blunt, stubborn and had soft corner towards his new, young wife. SHE was sweet, shy, soft spoken and little scared of her new husband. They were like oil and water in nature, yet complimented each other beautifully. No wonder they say ‘opposites attract’!!! Their life’s journey was smooth, without any bumps or u-turns, or without pot holes or hair pin curves… Until that day! It was last day of the month and HE had told her a day before that the money was tight! Like any middle class house hold, SHE had to manage the last remaining days with tight budget. But that day when she entered the kitchen to prepare dinner SHE was faced with new challenge! There were just few vegetables left in a pantry, a bit of this and a bit of that! ‘What shall I do now!’. SHE asked herself, little worried and little tensed as what to cook for dinner with its and bits of few lifeless vegetables lying in the pantry. Little did SHE realise that the worse was yet to come! Few minutes later SHE was faced with yet another challenge when SHE received a note from her husband that said some of his relatives will be coming for the dinner in 2 hours time!!! The effect of that note on her calm mind was like throwing pebble in to a calm, clear pond. SHE panicked. It felt like the ground below her shook her and her spirits! And then SHE remembered what her granny used to do at such situations… It took her a while to compose her thoughts and then herself but at last SHE knew what she could do to save the day and also her face in front of her husband’s relative who would be knocking the front door in few hours time. SHE shook off all the uncertainties from her head, collected her thoughts, straightened her shoulders and then smiled at the challenge that was thrown at her. What happened in next few minutes was like watching a professional ballet dancer do some graceful moves! She entered the kitchen and cooked a pot of delicious Sambar (South Indian Vegetable and Lentil Soup) using left over vegetables. While the pot of Sambar was simmering, she picked up the small sharp knife and went out into backyard to see if there were any edible vegetables/greens growing in the corner. To her utter disappointment except for few fresh herbs, there weren’t anything else that could be used in cooking. ‘But wait! What is it see in the corner’, SHE murmured to herself. ‘Oh, Colacasia!! !’ SHE cheered looking lovingly at the gorgeous heart shaped green leaves swaying at cool evening breeze. It took her few seconds to decide what SHE wanted to cook with these gorgeous green leaves and their tender stems. SHE swiftly cut few tender leaves along with their tender glossy stems and hurried inside. After washing the leaves under running water and removing their veins, SHE proceeded to make Patrode (Steam cooked spicy layered Colocasia cakes). While Patrode were steaming, she cleaned the tender stems of Colocasia and trimmed their ends. With the help of sharp, small knife SHE skilfully removed their peels and cut them into 1 inch pieces. After thinking for a while, SHE decided to use few fresh Jackfruit seeds that they relished a day before to use in the curry she just conjured up in her mind. It was a brave thing to do. Cook something entirely new to people whom SHE had never met in her life. But SHE was focused and had confidence in herself that it would work. Quickly SHE cooked the jackfruit seeds in salted water till tender and ground freshly grated coconut with few cumin seeds and a green chilli for little hint of spice. And in no time the whole new recipe for Colocasia Stems and Jackfruit Seeds in Coconut Gravy was ready. The tender sweet jackfruits complimented the crunchy, earthy flavour of Colocasia stems cooked in mellow, creamy coconut-cumin paste. When she served this Tender Colocasia Stems and Jackfruit Seeds in Coconut Gravy, her hand shook slightly with nervousness. ‘What if they don’t like it?’ she asked herself but it was too late to do anything else! SHE watched nervously when her husband and his relatives started to eat the curry she made. She prayed and hoped that it won’t disappoint them and her prayers were answered when she found them enjoying the curry and relishing them. And it was like reaching the stars when every one of them asked for second helping and then some for third! The Tender Colocasia Stems and Jackfruit Seeds in Coconut Gravy which was born under stress, necessity and lack of edible ingredients in pantry turned out to be most loved dish on that day’s dinner, appreciated and applauded by HE and his relatives. Are you still awake after reading my lengthy fictional story? You are really brave if you actually read the whole story and wise if you skipped it completely and decided to jump to recipe part ;) Today’s recipe of Colocasia Stems and Jack Fruit Seeds in Coconut Gravy is little unusual, unique and packed with flavour. This recipe is comes from my Ajji’s Kitchen and my Amma has very fond memories of this gravy cooked by her mother during Monsoons in India as Colocasia are abundantly available at that season. It is little tricky to cook with parts of Colocasia plants, but it beats down any of your favourite vegetables when cooked in right way with caution (written under Sia’s Notes). Most of you may have already tasted dishes cooked using its leaves (like Patra/Patrode, a steamed spicy layered colocasia cakes or the fritters made using the leaves) and it’s roots (used in making Sambar, stir fries etc) but using their stems may sound little out of the place! But trust me when I say that the stems of this versatile Colocasia plant are edible and they taste YUM! 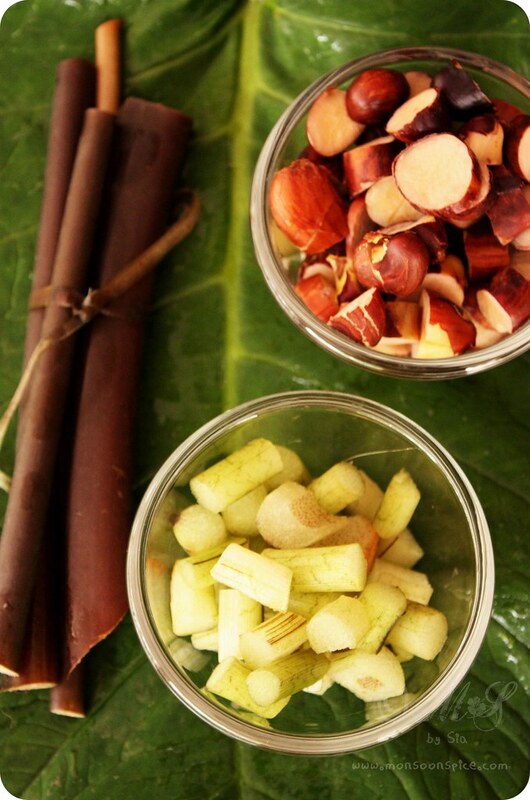 Unlike when cooking with their leaves and roots, you don’t need too much of tamarind while cooking the stems. Tamarind is generously used as the leaves and roots are quite itchy and you need to use good amount f tamarind to reduce this itchiness if you don’t want to end up scratching your hands and then mouth for hours!!! You need to pick very tender stems of Colocasia as they won’t have a thick chewy fibre that is not easy to eat or swallow! So taking with few precautions in hand, you will end up with one of the very best tasting creamy coconut gravy with melt in mouth jackfruit seeds and crunchy and juicy colocasia stems. 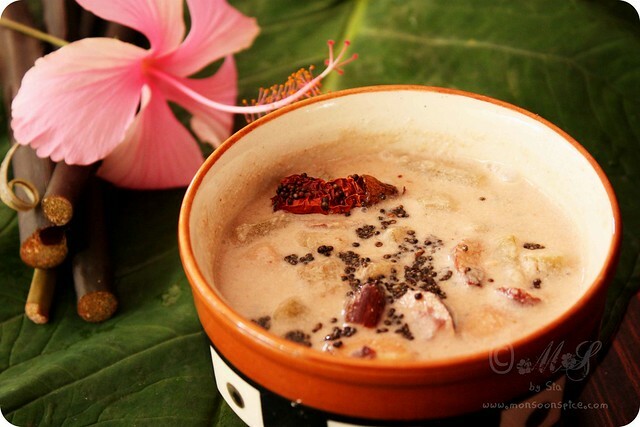 Curious enough to try this Tender Colocasia Stems and Jackfruit Seeds in Coconut Gravy? Let’s get on with recipe, shall we? Cook jackfruit seeds with a large pinch of salt till tender and keep it aside. Meanwhile, grind grated coconut, green chilli and cumin seeds to smooth paste by adding very little water. Keep it aside till needed. 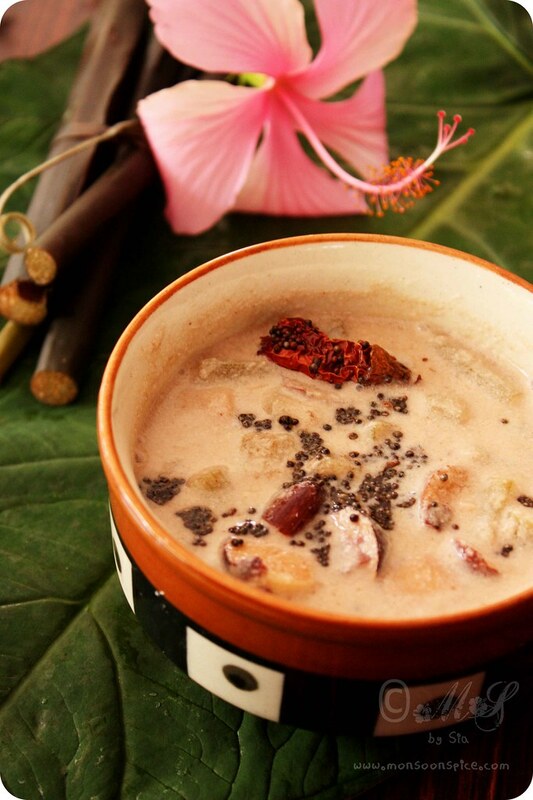 Bring 1½ cups of water to roaring boil and add tender colocasia stems and tamarind pulp to them. Cook them till they turn tender but yet retain their crunch, about 4-5 minutes. Mix in cooked jack fruit seeds, ground coconut paste and salt to taste and reduce the heat to simmer. Add little more water if you think the gravy is too thick. Cook till small bubble starts to appear, about 3-5 mins. Turn off the flame and keep it aside. For tadka, heat oil in a pan and add all tadka ingredients one after another. When mustard seeds start to pop and splutter, transfer the tadka to Colocasia Stems and Jackfruit Seeds in Coconut Gravy and mix them well. Cover and let it rest for at least 10 mins for all the flavours to blend well. Serve this flavourful Colocasia Stems and Jack Fruit Seeds in Coconut Gravy warm with Rosematta rice or any plain rice and pickle and enjoy! Do not boil the gravy too much after adding coconut paste as it may lose its creamy texture. If desired you can add ½ tsp of jaggery or palm sugar. This Colocasia Stems and Jack Fruit Seeds in Coconut Gravy tastes best with Kerala Matta Rice or Rosematta rice and tender mango pickle in the side. Choose the tender stems of Colocasia for this gravy. Make sure that the stems are washed and then wiped clean without any trace of water while cutting them. And also it is necessary that you have dry hands as if you use wet hands then the juice from Colocasia stems will react with the water and you may have to face the discomfort of itchiness! That recipe is very interesting! Jackfruit seeds and colocasia stems are uknown to me. Interesting recipe and nice pics. wonderful and healthy combo,the gravy luks delicious...too gud clicks. lovely recipe Sia and ur ajji must have been an awesome cook ! Loved the story and the beautiful pics. Lovely story! Please tell your Ajji that I love her recipe. Lovely tale and intriguing dish. Very unusual and looks utterly delicious. wonderful rwcipe sia,ur ajji is a wondeful cook.the gravy looks very different and this colacasia and jackfruit seeds gravy sounds very different to me.